By the year 2030, 26 states will have experienced a doubling of their 65+ year old population, with the majority of those elders still living at home. Chronic illnesses, disabilities, and any number of forms of dementia will require those afflicted elders to become nearly homebound. That change in life style will result in a lack of physical activities, some withdrawal from the social aspects of their previous lives, and an overall deterioration of their health (both physical and emotional). We at Visiting Angels have the good fortune to have an opportunity to intercede on this elder group’s behalf; yet how best should we move forward? We know through our current work that assisting with the elder’s personal needs is a solid way to allow them to remain in their own homes, which certainly is good for them emotionally. However, what about the other aspects of their life? What can we do to make their life at home better? It may be surmised that homebound seniors may feel alone and unsupported by not only their family, but by friends and perhaps the community at large. Even if their basic needs for meals, clothing, hygiene, and medical areas are covered; the senior may still need to fill voids in both physical and mental activities once filled by out-of-the-house activities. One way to bridge the gap from being a fully functional, community involved individual to that of a housebound, isolated aging hermit is to get involved in some sort of Telewindow activity (such as Skype). This use of computer technology brings outside people into the home of the elder by means of a computer screen and a couple of speakers. This is not only innovative, but actually working. Virtual senior centers can be a part of a homebound elder’s daily routine with such activities as reminiscing, playing bingo, having casual conversations, and even so simple as bird watching. These are all available means of bringing the outside world into the elder’s house when that person can’t get outside to experience that world directly. There are also telephone conference calls that can link several homebound seniors together with outside resources providing hours and hours of satisfying activities via a simple telephone. If the senior can get out of the house, even briefly, aquatic activities (exercise class for seniors in a local pool) are tremendously positive for both mind and body. Viewing the homebound person from a holistic perspective can open up avenues for enhanced activity selection too, such as performing exercises at home with instruction from an online instructor, or playing puzzle games or mind games (such as Nintento’s “Brain”) on handheld game boards or even via the computer. Remember, when combating isolationism it’s important to remain open-minded and creative. At Visiting Angels we perform a very necessary function in the lives of our seniors, especially those that are homebound, yet we can do more. We can offer more in the way of mind and body activity support. And, the bottom line is, by offering such homebound activities to our elders, we provide a means of enriching their lives, which then makes their choice to remain living in their own homes the right choice. Do some research, find out what is available in your community in terms of alternative activities and implement some of those into your elder’s life… Everyone will benefit. Looking For More Senior Care Tips? 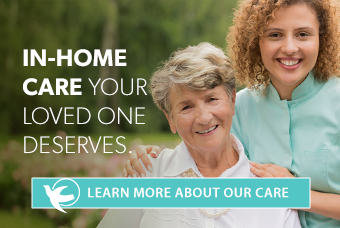 Receive advice and stories from experienced caregivers delivered to your inbox to help you provide the care your senior loved one deserves. Subscribe to get the resources designed to help your loved one live at home. Contact a franchised Visiting Angels office in your area for information on elderly home care services. Find our office near you.